Preface: Do I Really Need To Encrypt Every File on My Computer? May be answer is simple, all depends on your data classification label….. The focus: Informed sources told that access logs showed some 2,000 engineers or developers made approximately nine million internal queries for data elements that contained plain text user passwords. What is the objective of external audit? 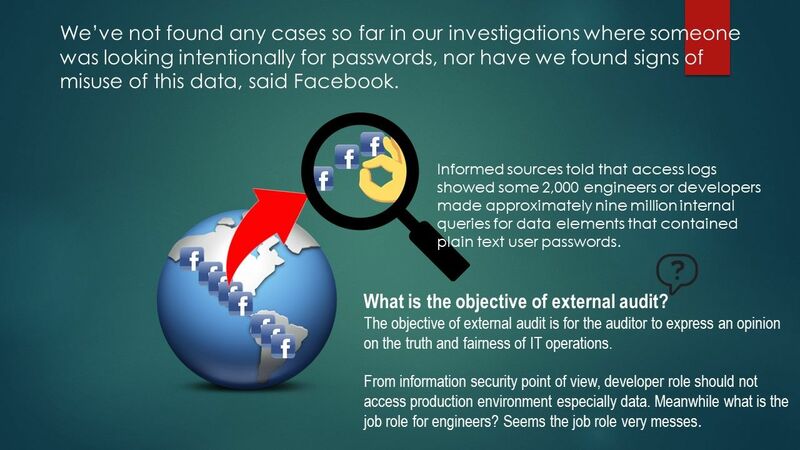 The objective of external audit is for the auditor to express an opinion on the truth and fairness of IT operations. Doubt? From information security point of view, developer role should not access production environment especially data. Meanwhile what is the job role for engineers? Seems the job role very messes. Previous PostCisco managed to conduct the remediation of IP Phone 8800 Series vulnerabilities – 20th Mar 2019Next PostOur Future especially Smart City is waiting for 5G mobile communication. Does your body ready for 5G signal?